The Boundless band offers the W freedom while allowing flexibility for use in a smaller scale layout. When using the Boundless W at its minimum size (.25″), house it within the Boundless band. 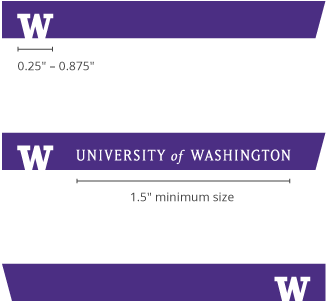 The band can be used to house the University wordmark or your departmental signature mark as well. The Boundless bar offers a platform for headlines and other prominent text. It can also be used as a graphic element. The band & bar has a 15-degree slant at one end that echoes the angles of the Block W logo. Preserve a clear area equivalent to the height of the Boundless W logo around the complete signature. Do not cover the band with type or other graphics. And remember the Block W logo can only be used in white, black, gray, gold and of course purple. Please do not make the W transparent, unless the background color is within the approved logo palette. Our Boundless band can align with either edge of a frame and may or may not bleed. It should not align with the bottom of a page in order to retain the integrity of the band shape. If you are using the University wordmark outside of the band, the wordmark should appear opposite the band within the page. Do not use the Boundless band and the large Boundless W together on the same page. In general, you only need one logo per page. Do not align the Boundless band on a bottom or top edge. For recommended use see styled headlines for more details.